Stylish and unique bags that were great for my business. Thank you Custom Earth Promos for the great and affordable product. I've been using this company for almost 2 years now and finally decided to write a review. They have yet to let me down, always being the best that they could be. Really appreciate everything Custom Earth Promos. Unique bags with flashiness. Gave these away at my trade show last month and they went over very well. This company is the best in the industry without a doubt. They offer literally everything. Full customization, affordable pricing, friendly products that last forever, and patient customer support. Very durable bag with a spacious amount of interior room. Thank you for the great service and product Custom Earth Promos. I really enjoyed how I was able to fully customize these bags just how I wanted them to turn out. Not many other companies in the industry offer that. Highly recommend checking out CEP. 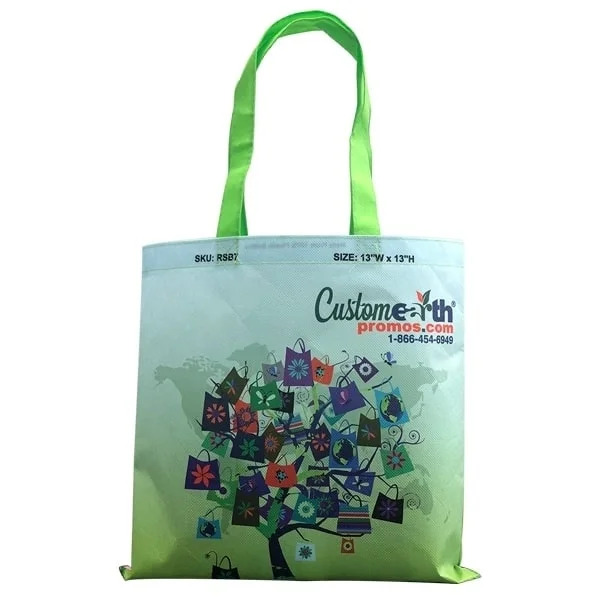 Reusable and recyclable custom-made sublimated eco bags. Great product from a great business. Thank you for all that you do for the industry Custom Earth Promos. Great promotional bag. Had the bags customized with my business logo and they came out perfect. Appreciate everything. Durable bag with a spacious amount of interior room. Eco-friendly and reusable too. Great company to work with. Customizable Options, like Picking Accent TrimColors! Your new favorite promo item is here! 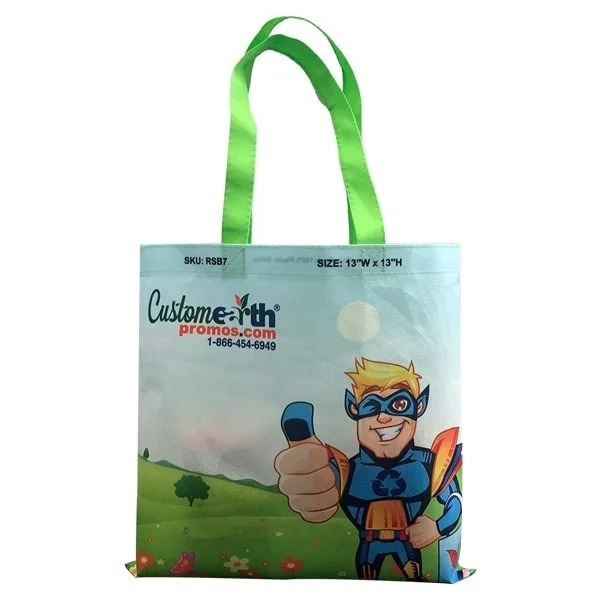 The new Recycled Custom Sublimated Bags are perfect for getting your brand into a new, green market. Printing on the 12" W (top) X 8" W (bottom) X 10" imprint area provides your business with more room to fit your whole design! You’ll be able to reach a new, green market that will benefit your business! Make sure your next promotional event is a splash with your clients! Using our eco-bag to highlight your company’s assets at aggressively priced options, there’s no way you can go wrong. 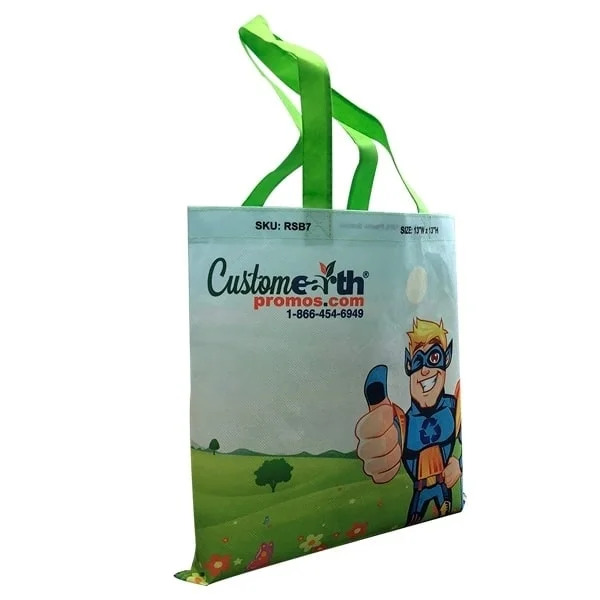 Just send in your personalized brand logo and we’ll help you make the best promo bag your organization has seen yet! The full color imprinting is perfect for getting your detailed messages across the entirety of the bag! Fit everything into reliable and durable bags, they’re perfect for any outing! With it’s unique “trapezoid” shape, you can fit more items then meet the eye in the tote. You can see your brand logo walking down the beach, the grocery store or in your next trade show! They will make the statement you are trying to communicate with an eco-friendly message attached Don’t miss out on your next greatest, imprinted marketing item! 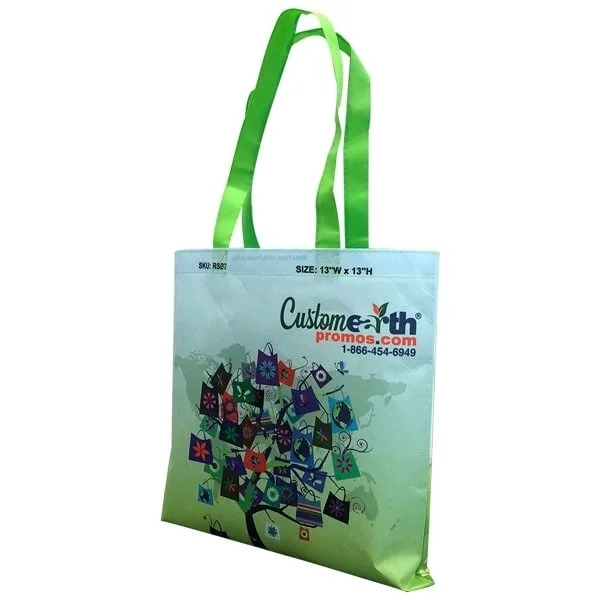 Imprinting your company design on our Recycled Custom Sublimated Bags is your quickest way to getting your name out at your next promotional event! Your clients will be walking around, advertising your business! You’ll work closely with our sales and design team to ensure your logo fits well onto the bag layout, and pick out new features that are available in case the present options aren’t working. We offer personalized handles, bag size, stitching, color details, you name it!